Many artists in the Academy attempted to combine features of Classicism with Romanticism, but few succeeded as successfully as Bouguereau. He trained at the Ecole des Beaux-Arts in Paris and exhibited at the Salon to an enthusiastic public. As the Industrial Revolution swept through Europe, Bouguereau made popular the depictions of young peasants personifying hope, innocence, and virtue. During his lifetime, he was recognized as a talented portraitist and awarded at many European expositions. Today, hundreds of museums and institutions around the world have his work on display, celebrating him as one of the most prolific and accomplished French artists of the 19th century. 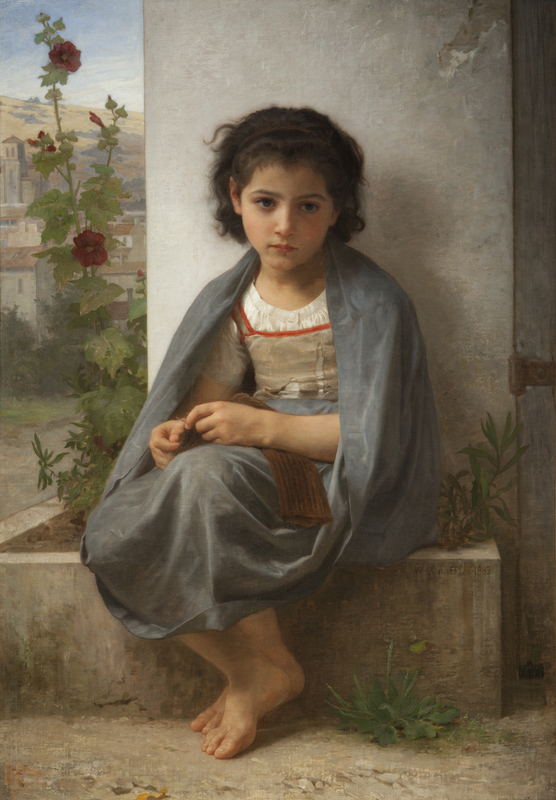 “William Bouguereau is unquestionably one of history’s greatest artistic geniuses. Yet in the past century, his reputation and unparalleled accomplishments have undergone a libelous, dishonest, relentless and systematic assault of immense proportions. His name was stricken from most history texts and when included it was only to blindly, degrade and disparage him and his work. Yet, as we shall see, it was he who single handedly opened the French academies to women, and it was he who was arguably the greatest painter of the human figure in all of art history. His figures come to life like no previous artist has ever before or ever since achieved. He wasn’t just the best ever at painting human anatomy, more importantly he captured the tender and subtlest nuances of personality and mood. Bouguereau caught the very souls and spirits of his subjects much like Rembrandt. Rembrandt is said to have captured the soul of age. Bouguereau captured the soul of youth. Considering his consummate level of skill and craft, and the fact that the great preponderance of his works are life-size, it is one of the largest bodies of work ever produced by any artist. Add to that the fact that fully half of these paintings are great masterpieces, and we have the picture of an artist who belongs like Michelangelo, Rembrandt and Carravaggio, in the top ranks of only a handful of masters in the entire history of western art. Having died in 1905, we can suppose it best that he was not here to see the successful assault on traditional art that turned the art world inside out and upside down in the decades that followed his death. His fate was to be much like that of Rembrandt, whose work was also ridiculed and banished from museums and official art circles for the hundred years following his death. Rembrandt’s reputation wasn’t resuscitated until the 1790’s (he died in 1669) due to the influence of the founder of the Royal Academy in London, Sir Joshua Reynolds. Even as recently as 1910, Reynolds paintings brought higher prices at auction than Rembrandt. Bouguereau’s re-appreciation can rather accurately be traced from about 1979 when his prices at auction quadrupled that year alone, and then was further catapulted by the 1984 retrospective that traveled from the Petite Palais in Paris, to the Montreal Museum of Fine Arts in Canada and finally to the Wadsworth Athenaeum in Hartford. In 1980 The Metropolitan Museum in New York permanently hung two of his works that been left in storage from early in the century. Since 1960, his values in the market place have literally exploded, doubling on average every 3.5 years. From works selling for and average $500 to $1500 in 1960, they have accelerated to where in the last three years alone his auction records have been repeatedly broken another 4 times. In 1998 The Heart’s Awakening sold for $1,410,000 at Christie’s New York. In 1999 Cupid et Psyche, Enfants sold for $1,760,000 also at Christie’s to be surpassed the very next day at Sotheby’s when Alma Perens owned by Sylvester Stalone sold for $2,650,00. That record only lasted one year until May of 2000, when Charite sold $3,520,000 back at Christie’s. Over the last 20 years his paintings all over the world have been taken out of their crates, basements, storage rooms and attics, dusted off, many cleaned and expertly restored, and today over a hundred museums and institutions proudly have his works on permanent exhibit. Reproductions of his paintings are selling by the millions in poster shops and gift stores world wide, and there is much evidence that they are even outselling the reproductions of paintings by any of the most famous modernists.